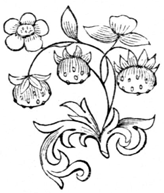 Copyright free and in the public domain, this simple black and white line drawing of young strawberries and flowers would make a perfect addition to your next creative project. Included in the 1864 work A Poetical Cook-Book, this image was not attributed to an artist. The author of the book was Maria J. Ross.